Click the images below to open a larger image. Hover over the image for a caption. I have been in Japan for 6 days and have begun writing this blog post at least two or three times. I am noticing that with such a unique and amazing experience, it is difficult to put it all properly in words or even know where to begin. My plan was to start from the beginning and share the airport and first train experience, because it was so unique. However, I was so in awe that I completely forgot to take photos! So, let’s save the arrival story for departure, and take a look at our first few days here, in Kyoto. 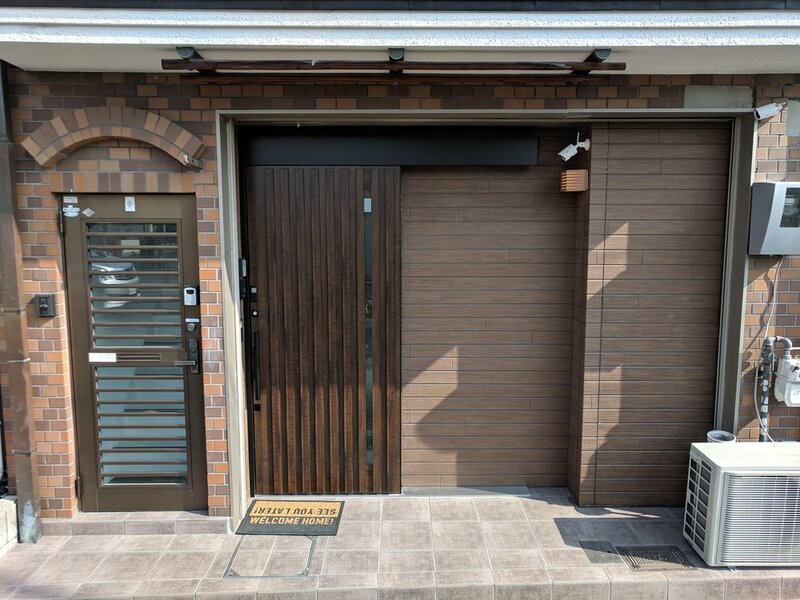 A hotel would give us an amazing commercial experience, but we stayed in AirBnB’s while in Japan, because it was so important to me to see how people live on a day-to-day basis. When we remodel or build a new space, we are looking for a lifestyle and atmospheric change. What better way to view this differently than to see how people live? This is after I found that my mat needed more oomph and stacked another on top of it. Our first home was near the Fushimi Inari Shrine in Kyoto, about a 20 minute walk. 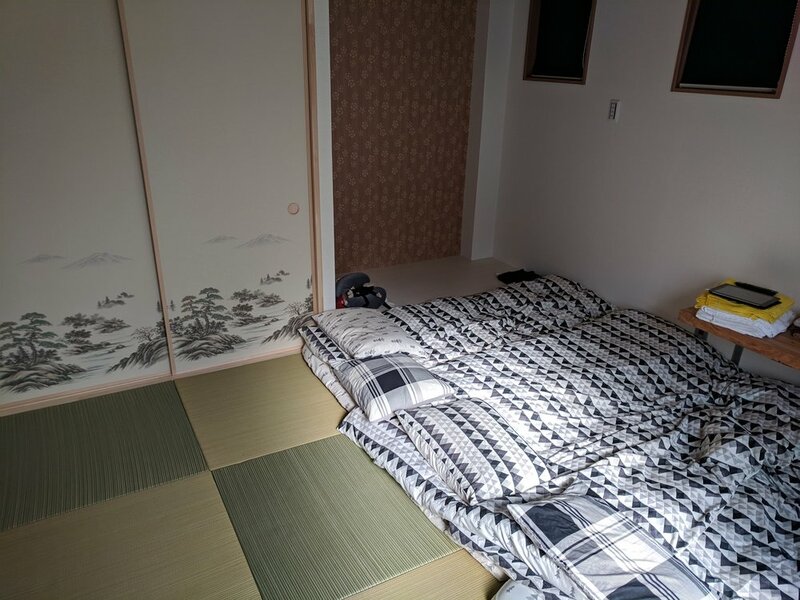 We chose a home with tatami mats so that we could experience sleeping in the traditional Japanese way. I had this idea in my head that the mats would feel heavenly- like memory foam mats on the woven mats below to provide a bit of “spring”. Nope. It was a bit more like placing a down comforter on a carpeted floor. Or, at least, it was to me. See, I got the flimsiest mat of anyone else in the family the first night. By the second night, I’d figured it out and stacked two mats! Maybe it was the jet lag, maybe it was the mat, maybe both. It could have been the midnight sirens (did I mention that Japanese ambulances make announcements so loud that I was sure a Tsunami was on its way into the town?) I never slept later than 2am in our first house. Maybe with some time and adjustment. I really enjoyed the tatami room, even if I did not get much sleep in it. I was enamored by the way the tatami closet doors slid perfectly with no track, just a groove in the wood. I loved the woven floors and ceilings, and the strange closet with no rod. There is something fantastic about sprawling out with your family on the floor with the warmest blankets known to human kind. Immediately after the flush- water running into the hand-washing area. Of all the amazing things in Japan, one of the things I most looked forward to, was the toilets. I have not been disappointed. It will be hard to return to the cold seat at home (there may need to be some changes). The toilet seats are heated, and it is a bit like the car seat warmer on a cold day- magnificent. Then of course, there’s the washlets. It all makes such perfect sense, and I’m a little apalled that it has taken our country so long to get the hang of this. First of all, when a Japanese washlet is flushed, water then comes out the top of the toilet so that one may wash their hands. That water runs into the tank to be used for the flush. Brilliant water savings, and while we have a few of these in the US, we typically are not set up with the warm water at the toilet or the electricity needed to heat the seat or run the washlet. Not only is this type of toilet a huge water saver, it is a cost savings as well (less tp to buy and lower water bills- sign me up!). What people talk about the most in a Japanese bathroom today is the bathing though, and yes, the Japanese definitely have it right… but our perception of it is all wrong (at least in my experience). If one searches “Japanese bath tub”, they are likely to find beautiful clay or porcelain circular tubs, almost like barrels that the user climbs into. In reality, the thing that is so spectacular about Japanese bathing is the ritual of it. First, you clean your body with the shower which is in the same room as the tub (the ones we saw were good old fiberglass rectangular tubs, but yes, very deep). The soaking is secondary, and for relaxation, not for cleaning. These rooms are not so much about beauty or aesthetics. They are more about relaxation. The way I see it, we can hit the best of both. Combine the function with the beauty. Bring the shower into the bathing space. Make those floors feel good on the feet and entirely slip-proof. Put an amazing, powerful fan into the bathing space, then relax and enjoy the beauty. Our house was a 20 minute walk to the Fushima Inari Shrine, and while there was plenty to do in Kyoto, this shrine kept calling us back. And, I’ll tell you all about it… the next time I sit down to write. A warm bath beckons! Next post: Fushima Inari Shrine in Kyoto!